Why is it Necessary to Learn Photo Editing? Are you spending a lot of time learning your camera and getting up early to shoot at just the right location, in just the right light? Are you getting the results you hoped you would? Learning effective photo editing is easily the other half of creating amazing images with your digital camera. I have been using Adobe Photoshop for many years, but have recently converted to doing the bulk of my editing in Adobe Photoshop Lightroom. Lightroom is a powerful program that offers you easy adjustments to push your photo editing and your photography from good to great. Advanced digital cameras have come a long way to getting you properly exposed images, but if you don’t know some simple photo editing techniques, you will be not be getting the maximum out of your camera. Lightroom not only offers amazing advanced photo editing techniques but also gives you the ability to easily organize your whole catalog of pictures with a series of tags and star ratings. I am now able to find a single image that is in my Lightroom catalog in a matter of seconds. I now have close to 20,000 images in my catalog, and finding images quickly is paramount. It takes a lot of effort to learn Photoshop or Lightroom. But these programs are so powerful, once you get the basic tools, you won’t want to go back. The advanced digital SLR cameras these days give you an option to create JPG images that automatically have preset settings as far as color, saturation, and sharpening. If you compare a JPG image and a RAW image you will see the difference. The JPG may look bright and saturated, where the untouched RAW may look flat and lifeless. Why is that? 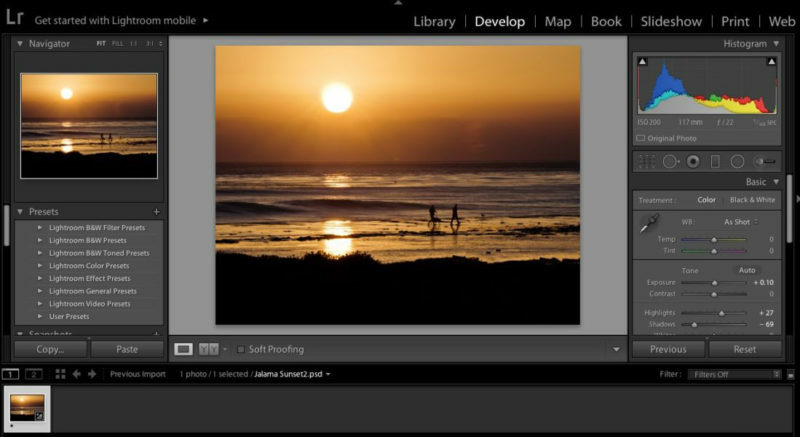 You have some control over in-camera processing of JPG images. You can go into your internal camera settings and increase saturation or brightness to your liking, but are you really taking creative control of your images? When you have a RAW file, you can non-destructively change the white balance, color contrast, and saturation to your liking. If you decide to change these settings with a JPG file in post-processing, with every adjustment, you are affecting the quality of the image and are losing resolution. At the very least, work with a TIFF file, where it has lossless image adjustment. If you have pre-visualized your picture when you take it, you will have a good idea of what you would like to do with this picture in post-processing. Why doesn’t the camera capture what I see? A digital camera can only read a certain range of light and gamut of color. By using post-processing photo editing, you are allowing the image to reflect exactly what you saw at the scene, or what you visualized when you took the picture. The trick here is to not over saturate, over sharpen, or generally overdo the editing process so it looks fake or cartoonish. I do very little altering of the original photo beside taking out small distracting elements, saturating a bit and sharpening the overall image. Practice, practice, practice. Take a good beginning course, or get a mentor who can help you with the process. If you are serious about your photography, you will be happy you did. If you are ready to learn more about this powerful program, join me in one of my online, private or group Lightroom classes. This is the other half of creating amazing images, learning how to effectively edit a program like Adobe Photoshop Lightroom. Better yet, take a photographic workshop with Jansen Photo Expeditions, and learn the techniques required to visualize and produce amazing landscape photography images, those you will be proud to bring home and practice your photo editing!